Okay, I gladly admit that I am something of a dry fly purist. I know a lof of you just shake your head at this but we all have different way of the /:Fly:/, some people see the challenge in catching many and big fish regardless of what method they need to use while others see the challenge in catching in what ever might be their preferred style; check nymphing, streamer, dry flies, upstream, downstream, single fly, tripple flies etc. For me it has always been dry flies. Sure I will fish a heavy nymph from time to time, and there are always one or two fish caught on streamer but my main fishing is done with dry fly, it’s something about the way you see the strike, the anticipation and the adrenaline. Glad we got that out in the air! Okay, so let’s move on to the topic of this post; my favorite dry fly! We all have one don’t we? The one we always fall back on, that fits our waters perfectly, that we can use for all kinds of hatches or just as an attractor fly to get grumpy fish to rise even when it’s no fish rising. The first fly I ever caught a fish on was a Royal Wulf, my biggest trout I caught on a parachute adams, my biggest grayling on a Streaking caddis and my biggest char on a wooly bugger (!). 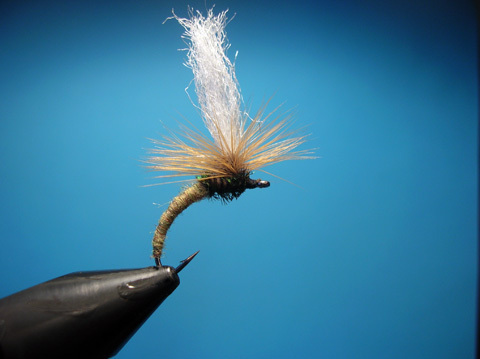 But as much as I like these flies (I don’t really like the wooly bugger though) none of them are my all time favorite. If I had to choose only one dry fly for my box it would have to be The Klinkhammer! Its original name is “The Klinkhåmmer special” but everyone I know just says Klinkhammer. Develped by Hans van Klinken from Holland in the 80’s he had tremendous success with it in mainly Norway and Sweden for grayling. 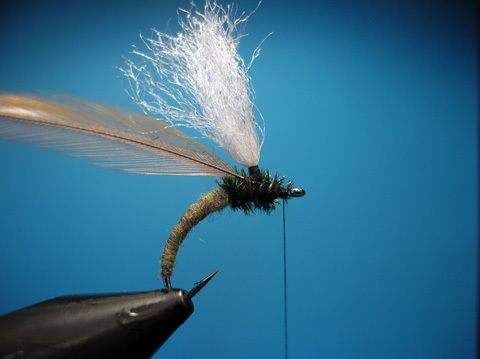 It has spread around Europe and become many fly fishermen’s favorite over the years. 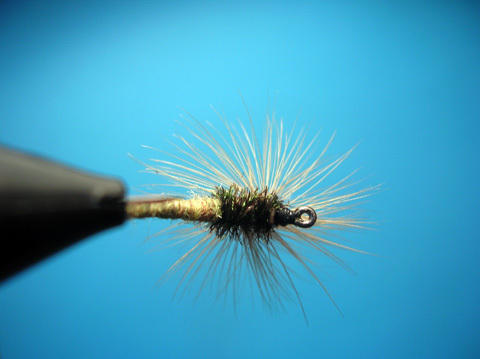 Adaption in color and size mean that you can fish it for most hatches, caddis, mayfly, midge etc. My two favorites include an olive one and a dark rust brown one. You can add tails, ribbing, another wing or any other adjustments that you want to fit your needs. The main thing about it is the way the whole hook section is submerged under the surface, creating a perfect emerger look to the fish. As easy as it is to tie I thought I’d put up a little Step by step for you! 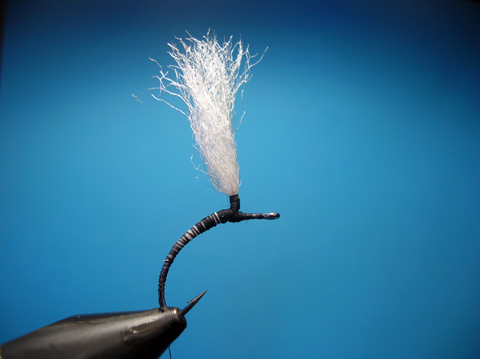 Bottom view, nice parachute hackle! 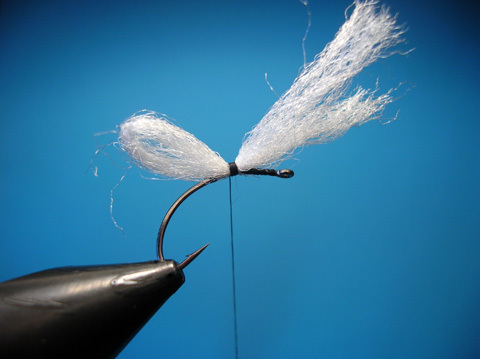 End the fly with a few whip finish at the head and add a few drops of varnish. Last but not leat cut down the wing leaving just a little piece of yarn sticking up from the fly. 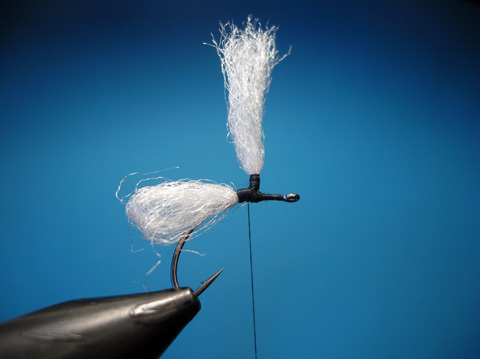 Wind the hackle 3-4 turns upwards and then down again 3-5 turns. 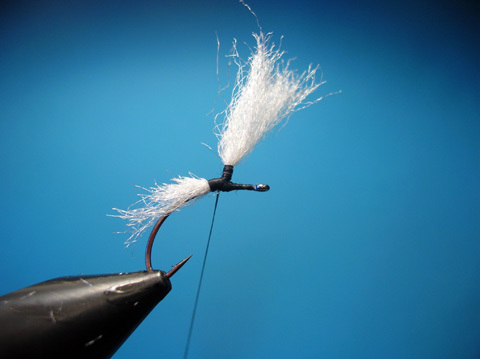 When you have reached the base of the wing you can hold the hacklel straight forward over the hook eye and tie it off carefully with the thread. The original pattern involved a second thread (Spiderweb) and tyign off the hackle at the hackle post, I have never seen the need for that. Twist the peacock herls together to a rope and wind that forward, doing a couple of figure 8 turns around the wingpost and tie it off behind the hook eye. Where the dubbed abdomen ends you tie in two-three peacock herls. 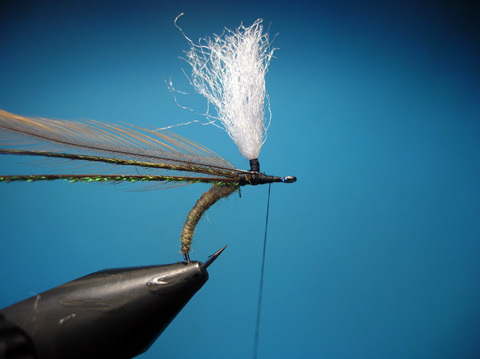 Now dub your thread with any dubbing of choise and wind the dubbed thread up towards the wing and stop so there is enough room for the thorax. 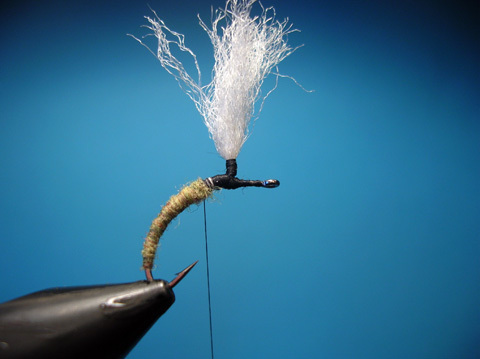 Wind your thread backwards tying down the tapered poly yarn creating a nice tapered underbody. Cut the part of the poly yarn that points backwards tapered, so that it is thickest close to the wing and thin at the back. Now wind your thread up the wing about 7-8 turns and then down again. 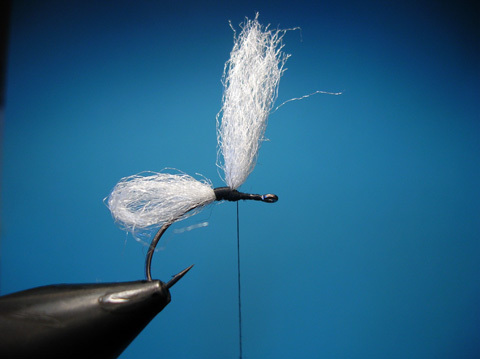 This way there is a better base for the parachute hackle to be wind around. Rise up the wing with your hand and wind hard turns just in front of it. Keep your turns close to the base of the wing creating a little cone of thread that keeps the wing straight up. Attach the thread and wind it backwards to a point in the middle of the to be thorax area. Tie in the poly yarn on top of the hook, securing it with 5-6 turns of thread. 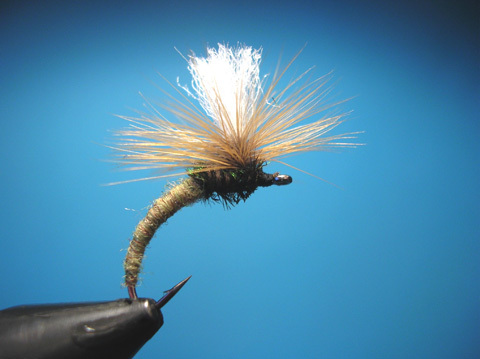 This entry was posted on Saturday, August 13th, 2011 at 09:39	and posted in fly tying, Step by step tying. You can follow any responses to this entry through the RSS 2.0 feed. This fly and the “Superpuppa” are my favorites. There is nothing like a dry fly take. 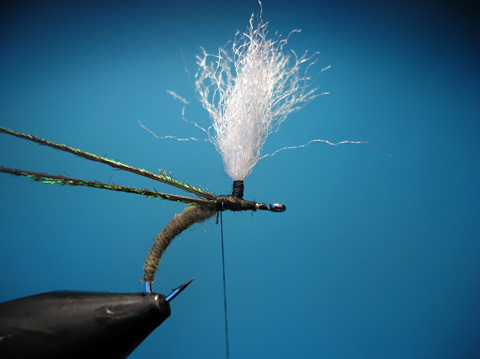 Great looking fly…I’ll have to try the Klinkhammer! Great fly! Thanks for the tutorial, I look forward to tying some of these up. Always have the klink in my bag especially on the river.Great new site Ulf.